At last we can celebrate spring and spend more time in the outdoors! Here is a list of simple or collaborative meals for when you return home. 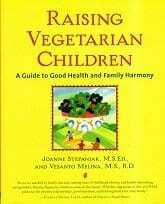 These and similar ideas are from Raising Vegetarian Children by J. Stepaniak and V. Melina (McGraw-Hill 2003). 2. Have everyone make-their-own-vegetable-pizza (or their section of a bigger one). Start with a purchased whole grain pizza crust, or smaller pita breads. As toppings, set out bowls of pizza sauce, grated carrots, and sliced mushrooms, olives, red, yellow or white onions, red, yellow or green bell peppers. If you include veggie pepperoni slices, cover the slices with a little tomato sauce so they don’t dry out. You might top the pizza with raw baby spinach after baking, and let it wilt slightly before serving. 3. Open a can of vegetarian chili or split pea soup. Add a fresh whole grain bun and a carrot cut into strips. 4. Serve veggie burgers on whole grain buns with all the fixings. If you like, serve these with oven-baked sweet potato wedges (instead of French fries). 5. Set out a salad bar. Provide bowls of salad greens, shredded or chopped vegetables, nuts and/or seeds, sprouts, cooked beans or cubes of marinated tofu, leftover cooked vegetables, avocado chunks, and a couple different dressings. Let everyone compose their salad just the way they like it. 6. Make a can of vegetable soup more hearty by adding some canned beans (such as black beans, chickpeas, pinto beans). Serve with whole-grain toast. 7. If kids (or adults) don’t eat vegetable at meals sticks, set out a platter of vegetable sticks (carrots, celery, bell peppers) before a meal or as a snack, without saying a word. Many excellent flavours of hummus are now available from supermarket coolers, as an optional dip. Kabobs are colorful, tasty, and fun to make. They are welcome at a barbecue, and you make them any time by browning them under the broiler. Served them on a bed of rice or in a pita pocket. Choose extra-firm tofu; it has been pressed to remove much of the water and holds its shape well on the 10-inch metal or bamboo skewer. Measurements are approximate. In a jar with a tight fitting lid, prepare marinade by stirring together ingredients. Add tofu, put on lid, and toss so that pieces are covered. Marinate 4 to 6 hours or overnight in the refrigerator, tossing occasionally to coat all pieces. Starting and ending with mushroom, place pieces of tofu alternately with one or other of the vegetables on skewer, with a tomato midway along. Place kabobs on cookie sheet or roasting pan, baste with marinade, and place 6 inches under broiler for 10 minutes; turning and basting with more marinade once. Baste with marinade, turning and basting with more marinade once. Remove when heated through and browned a little.